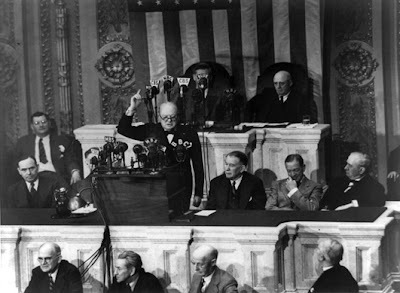 Prime Minister Winston Churchill Addressing a Joint Session of the US Congress in 1941. The U.S. House of Representatives will vote today on a resolution to honor Sir Winston Churchill with a bust or statue in the U.S. Capitol. The honor, proposed by Speaker John Boehner, would commemorate the 70th anniversary of the great wartime leader's address to a Joint Session of Congress on December 26, 1941. Speaker Boehner's resolution recognizes the enduring admiration Americans have for Churchill and recognizes the special relationship between the United States and Great Britain that is Churchill's legacy. It is also a fitting rebuke to our current President who returned the Churchill bust that had occupied a place of honor in the Oval Office. To provide for the placement of a statue or bust of Sir Winston Churchill in the United States Capitol. Resolved, That the Architect of the Capitol place an appropriate statue or bust of Sir Winston Churchill in the United States Capitol at a location directed by the House Fine Arts Board in consultation with the Speaker.